We all worry sometime or the other. And to some extent, worrying is just natural and unavoidable because so many things that are important for us are not in our control. Still, if we consider the amount of mental time we spend on worrying, we will recognize that it is enormous – and enormously unproductive, in fact counterproductive. While there are no quick fixes to the problem of excessive worrying, still we can progress towards a solution by appreciating that the same mental time can be more productively used by connecting with the one who is the controller of everything – including the things that are not in our control, the things about which we are worrying so much. The best way to shift our focus thus is by praying, praying not just that the uncontrollable issues be resolved but also that our own uncontrolled mind’s tendency to obsess over the uncontrollable be curbed. And that inner redirection happens through not just praying for something material but by praying to connect with the supreme trans-material reality, God, Krishna. 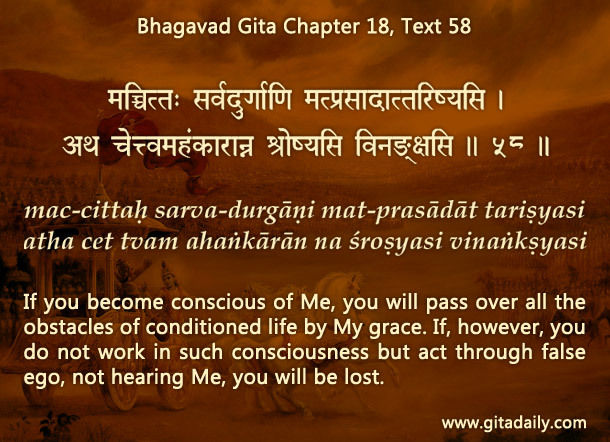 The Bhagavad-gita (18.58) assures that the more we become conscious of Krishna, the more we can pass over all obstacles by his grace. Henceforth, each time we start experiencing a worry attack – a sudden upsurge in our mind’s tendency to obsess over the uncontrollable – we can strive to become prayer warriors, who counter that worry attack by focusing on the Lord of our hearts and of our world, Krishna. The time-honored process of bhakti-yoga enables us to become expert prayer-warriors who can at will and with effectiveness focus on Krishna. Even if our bhakti practice doesn’t remove all our worry, it can decrease that worry substantially, thereby decreasing our distress and heightening our happiness. How can we get the impetus to stop or at least decrease worrying? When dealing with worry, what can we pray for? How can we become prayer warriors? Beautiful article, Prabhuji /\. It was very helpful to me. The words “…each time we start experiencing a worry attack – a sudden upsurge in our mind’s tendency to obsess over the uncontrollable – we can strive to become prayer warriors,..” was simply powerful :).